In May of 1903, President Theodore Roosevelt, planning a tour of the western forests, invited the naturalist John Muir to a four day camping trip in the Yosemite wilderness. The Tramp and the Roughrider illuminates this extraordinary encounter, with the action unfolding at sunset on Glacier Point, overlooking the magnificent Yosemite Valley. At the time of this historic meeting, many millions of acres of our western forest, with little or no governmental supervision, were being exploited and abused by hunting, lumber, stock and mining interests. The federal government had established only five national parks and was without a Park Service. Both of these characters were feisty and opinionated, with sharp disagreements on issues like hunting, animal rights, and forest management. Muir’s poetic and evangelistic temperament, clashing with Roosevelt’s political enthusiasms, spawned both tension and humor. Both skillful storytellers, it seems natural that both would seek to top one another by describing some of their many outdoor adventures. By the end of Roosevelt’s presidency, America could boast of an additional 200 million acres of forest wilderness, five more national parks, several new monuments (including the Grand Canyon) and 65 wildlife preserves. Lee Stetson’s stage career includes writing four one-person shows based on the life of the naturalist John Muir, and a fifth based on both Muir and President Theodore Roosevelt, entitled “The Tramp and the Roughrider.” These productions, with Mr. Stetson in the title role, have been presented in Yosemite National Park since 1983 to hundreds of thousands of park visitors. Additionally, the Muir shows have toured throughout the United States to schools, universities, park, museums, conventions, around campfires, on river trips, and for wilderness and environmental organizations from Washington D.C. to Hawaii, as well as in Scotland, Japan, and Canada. Joe Wiegand is the nation’s premiere reprisor of Theodore Roosevelt. Joe is a political science graduate of The University of the South, in Sewanee, Tennessee, and a former graduate assistant at the Center for Governmental Studies at Northern Illinois University, in DeKalb, Illinois. Joe’s live performances have been featured at hundreds of historic places associated with TR’s life and legacy. Joe’s Theodore Roosevelt is based on solid scholarship and delivered with Rooseveltian showmanship. Today, Joe performs in all fifty states and internationally. 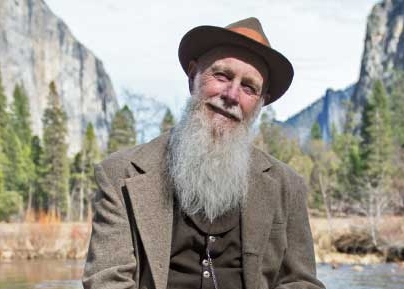 He has been featured in film and television, most recently in “The Men Who Built America” on the History Channel, and in “National Parks Adventure,” an IMAX film about America’s National Parks. Joe is featured every summer in Medora, gateway to Theodore Roosevelt National Park.